Pictured above at almost 2 years old. It took over a year, but I found someone I felt comfortable working with. Her name was Veronica, and she was going to breed one of her Ch females to a Ch male with a ton of agility titles - perfect! We waited, but unfortunately the female did not take. Veronica worked with me to find me a puppy, whether it was going to be one of hers, or not. Enter: Debbie, one of Veronicas good friends. I first met Debbie at a show on some county fairgrounds. That was when I met "Cassie" as well. Cassie reminded me SO much of my much-missed Jolie - looks and attitude. That day Debbie told me she was going to breed Cassie on her next heat. I explained how much I loved Cassie and would possibly be interested in a female puppy of hers. Debbie and I kept in touch over the next couple months. The litter was born Dec 28, 2007 - two males and two females, all sables. One female was my typical look (the Irish pattern with big blaze and white collar), and the other female was so plain Jane, but like Jolie. I visited the litter every two weeks. When they were 8 weeks old, I made my final decision. I went with the plain Jane girl since she would be better for conformation and seemed calmer, like Tigger's personality. Debbie thought each one would be good for me, and it was my choice, the other girl was to be excellent in agility but not so much in the breed ring, and Ky was going to do well in the breed ring, but might not have the drive for agility - ha! We brought Kylee home and she walked in like she owned the place immediately and started actually pushing the adults around Her and Tigger became best of buds right away. Ky was a very well behaved pup, she was never destructive or whiney. She would sleep through the night, play with us when we wanted to, and settle down on her own if we wanted her to calm down. Kylee and I learned to show together. For her first show, I had put her on top of her crate to groom her but she was not happy about it, biting at the brushes nonstop. Since then, she has come a long way, she now falls asleep on the grooming table and no longer tries to bite. She is now a UKC Grand Champion, and in 2010 we plan to go for her Canadian Championship. 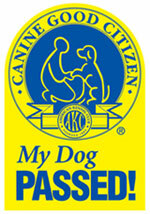 Kylee has also earned her Canine Good Citizen award, and we hope to add on more obedience and agility titles in the future. I could not have asked for a better start to the breed ring, or a better puppy. I am truly thankful to Debbie, for trusting me with the baby girl. Graphical collages courtesy of Mo van den Tillaart.